Book a summer holiday to Sunny Beach in Bulgaria and enjoy the newest attraction, the “Turbolance” waterslide in Action Aquapark! 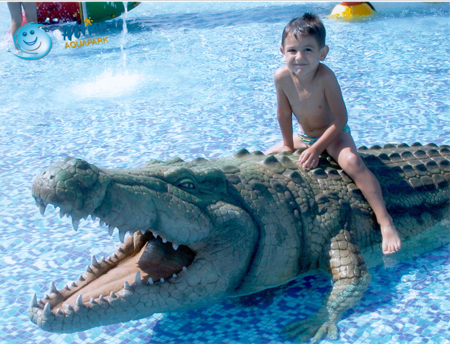 Action Aquapark spreads oven an area of 36 acres and offers more than 30 water attractions which will keep the whole family entertained throughout the day. Relax in the Lazy River, Jacuzzi or one of the pools, catch some waves in the king size Wave Pool, have a stroll around geysers, fountains, waterfalls, tunnels and net bridges at the amazing H20 Adventure Island or try out one of the exciting family slides. If you think you are brave enough - try one of the 6 extreme rides in the park: X-Treme, Free Fall, Turbo Kamikaze, Hydrochute, Twister or the new Racer Turbolance - a unique attraction consisting of two waterslides, combining the traditional black hole and an extreme wave-like slide. Be warned - Action Aquapark's fastest water slide is a drop with over 60 km/h speed, it's highest ride is 18 meters tall and the longest is 120 meters. Since 2010 there has been another attraction within the premises: a mini Animal Park with wallabies, emus and other animals. There are also fast-food and a-la carte restaurants, cocktail bars and an ice-cream house. All in all the park guarantees a great day out in Sunny Beach, Bulgaria for all the family.